Well, there you go. With all the rumors and news the last week or so about Kyrie Irving and his future with the Boston Celtics, this was our first opportunity to hear it straight from the horse’s mouth. Kyrie addresses multiple things in his press conference today which was supposed to be about his new movie Uncle Drew. However, with LeBron’s Decision Part III upon us, and the number of rumors linking him to the Celtics, and Kyrie away from Boston, the Boston media could only ask so many movie questions before we got to the good stuff. Kyrie ready for the daily barrage of future question but said focus is on 18-19 season. "I’m pretty sure management and I will have a talk, but that talk won’t happen now." If you are a basketball fan and pay attention to how free agency works, you should know that Kyrie was never going to sign an early extension with Boston. Financially, it just doesn’t make sense. That is why you don’t see it happen anymore unless you can throw the Super Max at someone, which the Celtics can’t with Kyrie. The Super Max if only for players who are on the same team that drafted them or were traded still on their rookie contracts. That is why DeMarcus Cousins wanted to stay with the Kings, there are rules to the Super Max. However, the Celtics can still give Kyrie a max contract, but the value of those contracts depends on what the salary cap is for that season. And with the cap going up every year, you tell me if you would want to make less money to make your teams fanbase feel more secure? This is why Kyrie was never going to sign an early extension with the Celtics. However, I believe that even though there is nothing official between Boston and Irving, I would bet a lot that there is a handshake agreement between the two sides that when Kyrie becomes a free agent, that Kyrie will sign for the longest term and salary that Boston can legally offer him. I don’t think Danny Ainge would have traded for him last season without such an agreement. This is just what I believe. Which is why I think that all this junk about the Celtics meeting with LeBron this offseason is just that, junk. The Celtics are not going to risk upsetting Kyrie by taking a lottery ticket in the Decision part III. And I do not blame them. LeBron is not coming here. He might not admit it anymore, but the Celtics are his rivals. They have been his rivals ever since the old days. Does this sound like a guy who wants to play in Boston? "You put my mother on the floor, and if she were in a Boston Celtics uniform, I'd break her face." — LeBron James, in an interview with me six years ago. So sorry bandwagon Celtics fans, LeBron isn’t coming to Boston. And getting a meeting with LeBron does not mean he is signing with the Celtics. 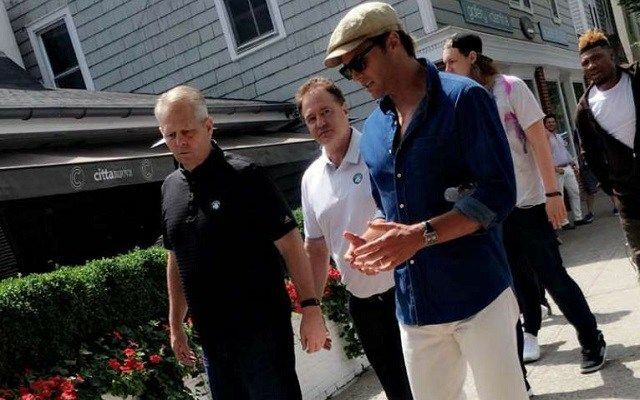 Just like it did not mean Kevin Durant was going to sign when this motley crew met with him in the Hamptons in 2016. So you tell me, is a 1/100 chance to trade for LeBron (he would have to opt-in and you would have to match salary to trade for him) worth upsetting a guy who is already in Boston and likes it here? My answer is no. So I am out on LeBron 2 Boston. Keep Kyrie happy at all costs. And remember media, one question about his future a day, plz. Now that we have gotten the contract stuff out of the way, can we please talk about how Kyrie talked about his teammates? If that didn’t make you want to run through a brick wall, I don’t know what will. Kyrie Irving is looking forward to some cutthroat practices in training camp: "Nobody’s going to be going at (Jaylen) as hard as Gordon is, and nobody’s going to be testing Gordon when he’s coming back and integrating himself back in like (Tatum) is." I would pay a silly amount of money to watch next years training camp. Terry also talked a little about it on First Take the other day, but these guys are all super competitive and they are all going to be coming at each other. Because even though it is all about coming together as a team to win a championship next year, you better believe that these hyper-competitive guys are going to be pushing each other. Next season could be a special one for the Boston Celtics. Next Who Should The Celtics Take In The 2018 NBA Draft?